What was your favorite part about the resort? It was a total toss up between the food & the service. EVERY meal was amazing & every staff member we came into contact with was eager to help us enjoy our stay. Many of them even knew us by name! If you had to pick just one, what would be your favorite honeymoon memory? 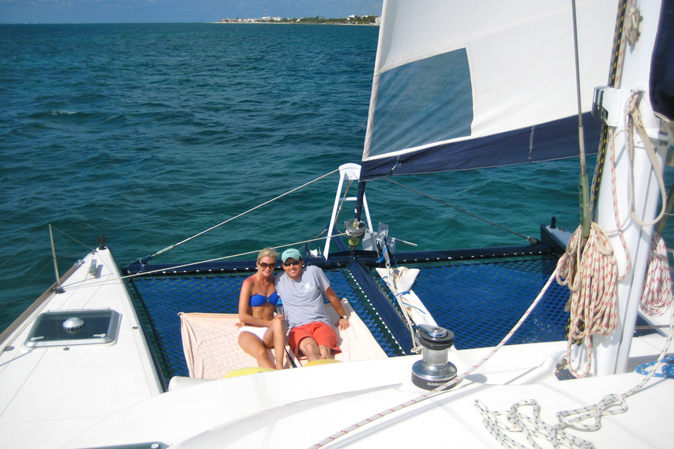 Definitely the private catamaran sail. It was just us, the captain, and a waiter serving us food and mimosas. It was so surreal to have such a private and exclusive experience. We felt like millionaires. Want to keep reading? Click here for the full blog on Ever After Honeymoons about Jordan & Katie’s honeymoon at Zoëtry Paraiso de la Bonita. This entry was posted in Zoëtry Paraiso de la Bonita and tagged Ever After Honeymoons, honeymoon experience, Mexico, Mexico honeymoon, newlyweds, Q&A, real honeymoon, resort review. Bookmark the permalink. They looked like they had such an incredible time on their honeymoon, I cannot wait to go on my honeymoon this year. We too chose Mexico for our honeymoon, we have never been to Mexico before but have always wanted to go, and luckily we are going for our honeymoon.